The stampede is here! Have you seen all the gorgeous hand-painted and designed Oxen around town in Hopewell? Thanks to the Hopewell Valley Arts Council the public can enjoy these transformed fiberglass installations until October 19th. Some ask, why a cow? Where did they come from? The idea was spawned from the original “Cow Parade” in Zurich, Switzerland in 1998. 800 fiberglass cows were painted and on display in the city for one year to attract visitors. Some can still be seen today. In similar fashion, after the exhibition, the statues were auctioned off with proceeds donated to various charities. This has since become a creative way for raising awareness and funding for the arts. The Oxen are worth a visit and is a very interactive exhibit that its nearly every corner and field in Hopewell. They vary from beautifully painted, covered in fabric, embellished with glass and ceramics and are worth a visit and make for some amazing photos. They were manufactured in Philadelphia by the Theme Factory and will be here until mid October. 2) Drive around following the map and stop along the way. 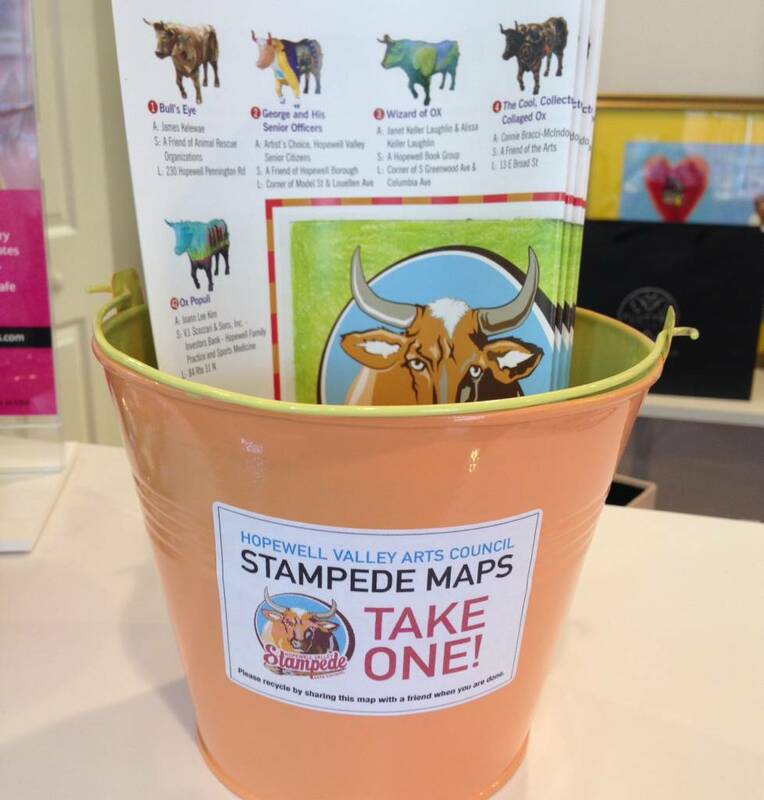 3) Scan the QR codes on all 68 oxen and be entered to win a contest with prizes. 6) Bid on an Ox during the online auction (live now). On January 24th there will be a “Ox’tion Gala” at the Grounds for Sculpture where 11 of the “Best in Show” will be sold via live “Oxtion”. Maps of the locations of all the Oxen can be picked up in various places the boro like Twine, The Library, Brothers Moon or the Brick Farm Market. You can also check out the Google Maps and track their location. Do want to get a little competitive with those photos? The Blue Bottle Cafe is challenging all shutterbugs to submit their favorite pictures of the Oxen and win a chance to win a free dinner. Use #oxesfordinner #photocontest on theirInstagram handle, @bluebottlecafe. The Hopewell Valley Community Bank is also hosting a “Oxen Selfie” photo contest. Just “Like” them on Facebook, post a selfie with one of their four Ox then Share with your friends. The winner with the most Likes can win $200. Be sure to join in on the fun and enjoy this very oxciting time in the Valley.